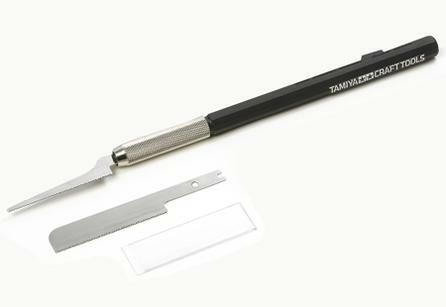 This handy tool is perfect for modifying plastic models or Mini 4WD machines, as well as woodcraft. Its blades are slightly thicker than Item 74018 Mini Razor Saw and therefore less prone to distortion or warping. The item includes 2 blades of different width, and features fine teeth which enable it to cut through a variety of materials while leaving a smooth finish. The 2 blades can be inserted into the included plastic grip, which features the Tamiya logo. Both blades are of .35mm thickness.